Adam Rubin/ESPNNewYork.com The Pirates have had trouble fielding a winning team, but their ballpark, PNC Park, is among the best. I've been to every current stadium in the majors and 50 overall (one more than Jamie Moyer!). Aside from personal opinion, my rankings are based on a loose combination of architectural design, surrounding scenery, history, fan friendliness, comfort, sightlines, food, scoreboards and how the stadium fits into the city and neighborhood overall. Note: With so many great new stadiums, even a lower ranking doesn't mean the ballpark isn't a good place to watch a game. 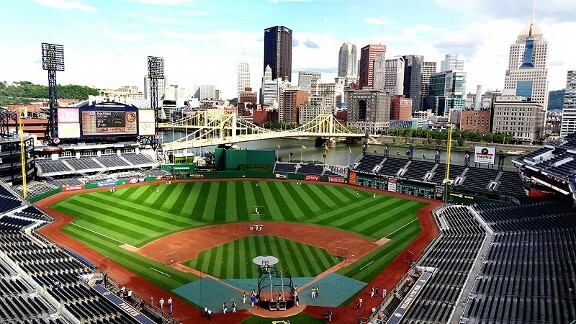 PNC Park -- The Pirates haven't done much right in past 20 years but give them credit for this, a perfect blend of location, history, design, comfort and baseball. Could not be more beautiful if Frank Lloyd Wright and Ray Kinsella had teamed on the design. Fenway Park -- Close your eyes in this century-old cathedral of baseball history and you can almost see Babe Ruth on the mound, Ted Williams at the plate and Yaz in front of the Green Monster. Still a model for how a ballpark should look after 100 years. AT&T Park -- Cozy and intimate, with the best view in San Francisco since fans could watch Willie Mays in his prime. And best of all, Giants paid for it themselves. Camden Yards -- Twenty years later, the gorgeous first retro-park figures to stand the test of the time even longer than a Cal Ripken playing streak. Target Field -- From its location at the edge of downtown to the wild rice soup in the concession stands, the only way this place could say Minnesota any better is if Garrison Keillor was the PA announcer. Wrigley Field -- Baseball's own little Time Machine to remember what the game used to be like, way back when the Cubs still went to an occasional World Series. Comerica Park -- Filled with beer halls, a merry-go-round and a Ferris wheel, this is as colorful and welcoming as a state fair -- and I would put my money on Justin Verlander knocking down all the milk bottles in the midway with one fastball. 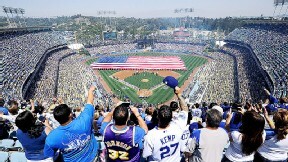 Dodger Stadium -- Don't think the Dodgers are really worth $2 billion? Maybe not, but on some evenings, with the sun soaking the San Gabriel Mountains, a seat here will make you reconsider that. Angel Stadium -- Now that Albert Pujols is at first, this gives Disneyland an even more serious run for the money as the happiest place in Anaheim. Safeco Field -- Located just down the road from Fenway Park (well, make that 3,000 miles down I-90), this is perhaps the most accessible, fan-friendly park in the majors. The only thing missing is a view of Mount Rainier (or Ken Griffey Jr in center field). Coors Field -- This is a lovely brick structure in a dynamic downtown neighborhood with plenty of parking, distant views of the Rockies (the mountains), better views of the Rockies (the baseball team) and a brewpub that creates the finest beer you can drink at a ballpark until a team starts playing at a Trappist monastery in Belgium. Kauffman Stadium -- Remodeling Kauffman Stadium was like sending Angelina Jolie to a plastic surgeon: completely unnecessary but a nice effort nonetheless. Citizens Bank Park -- Cozy with the wonderful Ashburn Alley concession area, not even Philly fans can complain about this park. Petco Park -- You can't walk around the ballpark without having your view frequently obstructed, which the Franciscan Order of Ballpark Architects should deem a mortal sin for any stadium. But the architecture and fish tacos make up for that. U.S. Cellular Field -- One of the best kept secrets is that the ballpark on Chicago's south side is pretty damn nice, too. Much improved from when it opened, the ballpark is easily reached via the red line, there are excellent concession areas and best of all, it has a world championship banner from this century. Turner Field -- Carl Lewis won his final Olympic gold medal here in the 1996 Olympics before the stadium was converted nicely to baseball. There aren't too many ballparks where Lewis performed, and given his form when throwing out a first pitch (or singing a national anthem), the fewer ballparks he performs in, the better. Progressive Field -- I like everything about this place except for the three levels of luxury suites that run foul pole to foul pole in an unofficial tribute to the 1 percent. Busch Stadium -- No more view of Pujols but still a great view of the Gateway Arch, lots of beautiful red brick and more statues than in Rodin's studio. Citi Field -- It's way better than Shea, though that's a pretty low bar. A good stadium, but it needs to celebrate the Mets more and the Brooklyn Dodgers less. Minute Maid Park -- I like this stadium because it feels like an athletic arena, not a shopping mall. Rangers Ballpark in Arlington -- It's a good park, but its urban architecture feels out of place for the location and the office buildings in center are a drawback. Who wants to see the office when you're away from the office? Yankee Stadium -- It's big and grandiose, the way Yankee Stadium should be. But despite the careful detail to match old Yankee Stadium, it feels way too much like a shopping mall with a ballpark attached to it. Chase Field -- It's not bad, but it's also the only stadium that is inferior to its home team's spring training site. Miller Park -- It reminds me too much of an airport terminal, with no flights to the World Series. And why doesn't Bernie Brewer slide into a beer mug anymore? Great American Ball Park -- It fails to take full advantage of its riverfront location, has a sterile, metallic feel and the design simply lacks creativity. But it's still way better than Riverfront. Marlins Park -- When the roof is open, it ranks much higher. Unfortunately, the plan is for the roof to be closed most games. Like a Cuban sandwich, it has good local flavor but it also lacks almost any baseball reference/history anywhere other than in the luxury suite levels. Nationals Park -- It's a nice place to watch a baseball game -- especially if you have a Washington lobbyist paying for everything. The best seats are the cheapest: high up the left-field line, with a view of the Capitol. Oakland Coliseum -- This used to be one of my favorite ballparks, but the Raiders completely ruined it by removing all the charm and replacing it with Mount Davis in center field. Rogers Centre -- They built this just before the start of the retro-park craze. Too bad they didn't wait a few years. Tropicana Field -- Tampa-St. Pete built this in the late '80s to tempt other major league teams to move here. No wonder none did. 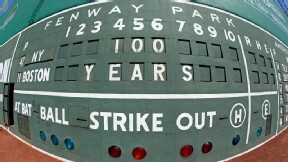 I hope Fenway Park lasts to celebrate a second full century in baseball. Although I shudder to think what ticket and beer prices could be there in 2112. Fenway Park opened 100 years ago April 20, and it's still the model for what a baseball stadium should look like. 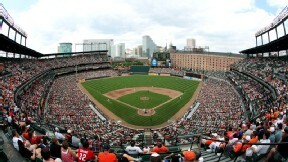 Ever since Camden Yards opened in 1992, teams have blackmailed taxpayers into spending billions of dollars for lavish, new stadiums, many of them designed to remind fans precisely of old parks such as Fenway, which was built in less than seven months and without public financing. Fenway Park's 100th birthday was marked by more than 200 returning Red Sox players and 37,000 fans, the Yankees and Red Sox wearing 1912-era uniforms, at least a dozen books dedicated to the stadium, a commemorative magazine published by the Hall of Fame, a national broadcast and a special musical theme scored by famed composer John Williams. 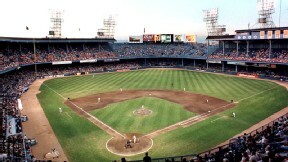 Tiger Stadium's 100th anniversary that same day, however, was commemorated by 200 or so loyal fans gathering over the course of the day at what remains of the beloved old park -- the field, the flagpole, an entry gate -- at the corner of Michigan and Trumbull. Mike Downey counts down his favorite moments -- and they're not all about baseball -- while calling on a few eyewitnesses along the way. When a gleaming new stadium called SkyDome opened in Toronto in September 1989, Larry Lucchino, then the president of the Baltimore Orioles, walked across the artificial turf, gazed at the retractable roof, gawked at the hotel that rises above center field and stared at the monstrous video screen that seemed the size of a football field. Awestruck, he said, "They built the eighth wonder of the world. We're just building a nice little ballpark." That nice little ballpark -- Oriole Park at Camden Yards -- is now 20 years old. And Lucchino was right: It's no SkyDome (now called Rogers Centre). It is better, in its own way, than any ballpark, magnificent in its understated, comfortable, cool sort of way. Call me crazy, but doesn't it defeat the purpose of a retractable roof if you keep it closed? Miami is different. Temperatures average 90 degrees with suffocating humidity during much of the season so folks here prefer a cool, comfortable seat over Elysian field esthetics. When I asked one fan what she liked most about the Marlins' new stadium, her answer was succinct: "The air conditioning."